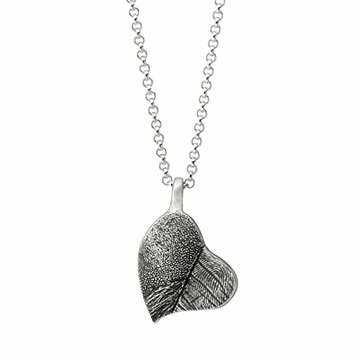 Your fingerprint and your pet's paw print combine to form a sterling silver heart. Best friends come in all shapes, sizes--and species! From the sweet face that nuzzles you awake every morning to the wagging tail that greets you when you arrive home from work, there's nothing quite like the wild adoration we feel for our pets. Kaleen Wolfe captures the special bond between (wo)man and beast with her sterling silver pendant that combines your fingerprint and a portion of your pet's paw print to form an asymmetrical heart. Just press your finger and your pet's paw into the mold provided and Kaleen will cast your impressions in solid silver to form one unified heart. Celebrate your pup's dogged loyalty or your feline's infectious charms, or have two necklaces made to proudly show your doggone devotion to both of your furry friends. Handmade in Pennsylvania. This is a made-to-order item. You will receive a pre-paid shipping label and envelope to mail the kit to the artist.You will be provided with a ship date for the final item after the artist receives your kit. This item typically ships 5 weeks after the artist receives the kit.At this time, this item cannot be shipped to P.O. Boxes or to APO/FPO or US Territories. Contact custom@uncommongoods.com with any questions. This is my most treasured piece - it's priceless! I totally love this necklace. When I wear it, I know that Hampton is close to my heart! Literally and figuratively. While he is no longer here with me on earth, his spirit lives on. And, this necklace allows me to still touch his paw and remember what a terrific companion he was! Kaleen was wonderful to put her heart and soul into creating it. While we've never met, her thoughtful note that arrived with the necklace was personal and touching. Great for any pet lover! You will cherish this piece of personal art forever.